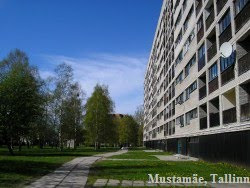 This and next two posts will be about Tallinn's Old Town part so little bit away from the usual blocks. There are some nice rectangles! But also some houses that shouldn't belong there. The old wall surrounding Old Town is very nice. I like Old Town very very much and I am happy that I can visit it anytime I want (I feel the same about Lasnamäe). Maiden Tower (Neitsitorn). This nice tower has been renovated in autumn 2013 and is again open, together with a cafeteria or something, but is also a museum. Some Estonian artists used to live here in soviet time. Town Hall. Not a complete photo but you've seen the whole building anyway :) It's been under renovation for the past 50 years. Minimalistic part of Town Hall. Today there is a good Indian restaurant on the right. A walk on one part of the city wall. Sometimes Old Town looks like this. Right next to St. Nicholas church. There are 4 viewing platforms like this one above. I like this one. Modern and simple. Built around 1960's, as a house of writers. This area was badly injured because of bombing in the Second world war. The right side of the street was taken down completely, left side partly. I haven't seen anybody liking this building (especially here). The same bombed down area, house of writers in on the left out of picture. There has been flowerfestival behind the city wall in the past summers. Some views of city wall with these gardens (it is actually garden festival). Surprise! It is in Old Town but surrounded by other buildings so not much visible from streets. And the area on the right of it. "Sõprus" ("Friendship") cinema is on the right, also built on a place where there were old houses before the Second world war. And walking out of this inner yard, "Gloria" restaurant entrance is on the right out of the photo. There is a lonely window and a long long balcony. Private walking area on the city wall. They've closed the gap with a house this way!